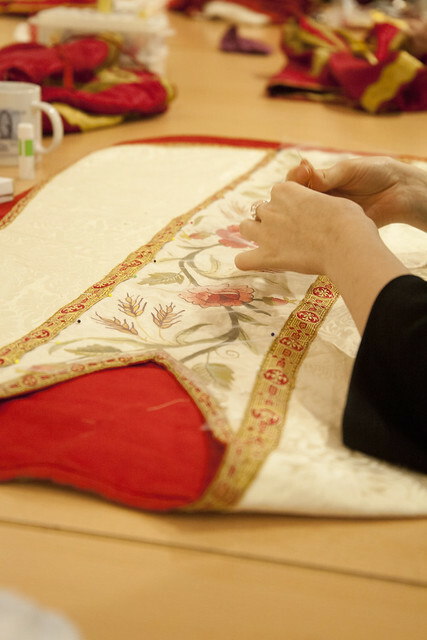 The Guild today runs two Sewing Retreats each year, where liturgical sewing is combined with spiritual talks and liturgy, one in the spring and one in the autumn. It also runs Vestment Mending Days in London on Saturdays. Local meetings are organised by the London and Oxford groups. Everyone is welcome at Guild events: we can find tasks appropriate for all skill levels. The Guild is affiliated with the Latin Mass Society, which was founded in 1965 to promote traditional Catholic liturgy. The Latin Mass Society is a registered charity, number 248388. The Guild’s spiritual patron is St Clare of Assisi, who, like many female religious over the centuries, made liturgical vestments. You can support our work with a donation to the Latin Mass Society, if you specify its purpose, here.